A retired oak wine barrel is transformed into a rustic and inviting bistro table with a set of matching bar stools. Storage inside and bar rail at base. Stools on thick staves with wrought iron braces, Wrought iron foot rail, weathered finish. On the Bistro Table a pine tabletop is set at cafe height for relaxed dining or quaffing. There's a convenient cabinet to store glassware, tableware or spirits bottles and a traditional bar rail adds to your comfort. Just like fine aged wine, our Vintage Oak Barrel Stools with leather seat will stand the test of time. Thick recycled staves from actual oak wine casks form the legs, reinforced with hand-forged wrought iron braces. Set includes 1 table and 2 stools. This item ships directly from the manufacturer via Door-to-Door Delivery. Please allow 4-6 weeks for delivery. Select items will have additional shipping charges, please see above for this item's additional shipping charge. Is the top round wood on the wine barrel is removable? BEST ANSWER: There are 4 screws attaching the round top to the main barrel. I suppose if you wanted to remove them, you could. There are 4 screws attaching the top to the main barrel. I suppose if you wanted to remove them you could. Yes, it can be removed but then you will see screw holes. Yes. It has several screws securing it to the barrel base. Sorry but it is welded on so not easily removable. You could unscrew the wooden top. Does this set come assembled? BEST ANSWER: Yes this product comes assembled. Yes, it is already assembled. I just purchased a Bistro Table for my lake house and am concerned about the durability of the foot rest. The spike bolt on the outside of the barrel is only held in with two small screws and appears not strong enough for someone to rest a foot. My fear is that if anyone stepped hard on the foot rest it would break the bracket from the barrel and crack the barrel. My question is, has anyone had any problems with the foot rest? I would like to reinforce it before I have a problem. Other than that concern I love the table and look forward to enjoying it with friends and family. BEST ANSWER: Reviewers do not report having the problem that you mentioned as a possibility. In fact, reviewers have reported that they are extremely pleased with the design and durability of the Bistro Table. 800-648-6058 for your specific table. We have a door that has an opening of 29". Is the kick rail the widest part of the barrel listed in the dimensions at 29"? BEST ANSWER: The width is actually greater than 30 " at the widest part at the bottom. Yes, the widest width of the table is 29 inches. can I get a phone number so I can order this furniture by phne? also can I purchase extra chairs. this site is not very user friendly and does not allowing me to add other items and such. what happened to simply call the operator and order items. I called to order my set and the Customer Care team was extremely helpful. You can find the contact number online (wouldn't accept a phone number in my post). They helped me add stools, and modify to my liking. They were very easy to work with. Do you have a large floor standing GLOBE bar? BEST ANSWER: Thank you for your question. This item cannot be placed outdoors. It will not be able to handle the elements. If you have any further questions, please call us at 1-800-356-8466. Is it big enough to put 4 chairs with this table? Yes, this table is big enough for 4 chairs. Yes, the table is available separately. The item # is 3251013. I have been eyeing this set for months but then in September I finally bit the bullet and purchased it. It took a while to arrive, but I did not mind the wait. Later I realized that the table is approximately 140 lbs and I do not have the proper equipment to move it; I paid and upgraded the standard delivery service to a white glove delivery with Adam's help from Wine Enthusiast. However, due to logistics and/or communication problems, when the delivery arrived, it was not upgraded to white glove delivery. I told the truck driver that I did upgrade to white glove delivery but his papers showed only standard delivery. I asked him to at least move the bistro table into my apartment as I have no way of moving it and he was nice enough to move it into my apartment, but I had to move the stools myself as well as removing and disposing all the boxes and whatnot. I called Adam about the situation and he apologized and helped me upgrade my next item, the whiskey barrel coffee table, to white glove delivery free of charge which was really helpful considering that the coffee table is just as heavy if not heavier than this table. Adam is excellent on keeping on top of things, but the shipping company on the other hand (still waiting on the coffee table to arrive)... no comment. THE SEAMS ON THE WOOD ON THE LEG OF THE CHAIRS WERE BUBBLED, THE TABLE WAS CRACKED AND THERE WAS A PIECE OF WOOD MISSING AT THE OPENING OF THE TOP OF THE DOOR ON THE TABLE. This was my Father's Day gift. It really is a Real Oak Barrel. Found it to be well constructed, nice finish and stools are comfortable. Lot's of storage inside. Great in game room or for wine tastings with friends. It is heavy and make sure you measure door width. Sorry I waited so long to get it. Really great. We were getting a little impatient waiting for the wine barrel. It took roughly 6 weeks from the time we place the order. But sometimes good things are worth waiting for... that is the case with this wine barrel and stools. Right on time and very professional! This has become the favorite piece of furniture in my house. It looks authentic, it is very solid and practical. Lots of storage room inside. I placed it in the dining room and it draws attention to anyone coming to our house. The only downside is that I've been drinking way too much wine sine I purchased it. I love to sit on one of the chairs and sip from a glass of wine. Received it out of the box wobbly. Called Wine Enthusiast about it, they said they would call the vendor. Waited 2 weeks -no reply. Called WE again, they never heard from vendor. To call again and call me back-never called me back. Not good service from vendor or company. Very disappointing especially for the amount of money we paid. Wonderful addition to our bar area. A functional and attractive addition to our bar area. Be sure to have some strong backs available to move, as the item is quite heavy. The photos don't really do justice to the quality of these pieces. The product arrived on time and in great condition. It initially had a strong stain odor but after one week in the garage, the stain smell completely went away. It looks amazing in my wine room and the product definitely surpassed my expectations. The price was really good and I got half off shipping. I absolutely love it!!! What an addition to a rustic style den! This bar set is gorgeous. It is much more beautiful, heavier and larger than the picture could ever show. The storage area inside this barrel is amazing. The only problem I have is that one of the stools is not completely level and has a slight wobble. I think we'll just sand down the bottom of one of the legs and hopefully it will sit just fine. Other than that, we've gotten oooh's and aaah's from all of our family and friends who have come over for the holidays. Product arrived with numerous rubs on the wood finish and a broken hinge on the barrel storage door. This was due to a very poor packaging job. No protective foam to pad the product, especially the table top. Only one nylon stap secured this very heavy product to a shipping pallet. The product had 4 stools in boxes on top of the barrel table all under one loose strap so the pieces chaffed each other. I spent a couple hours touching up the rubs on the surfaces. Customer service was curt and impolite. I did get 2 new hinges to replace the broken one that I will install myself. They offered no other compensation for the trouble and said I could ship it back and they would refund my money period. This table and 4 stools cost over $2,000 including shipping of $300. They should have been polite, eager to help and offered a free wine voucher or a future discount since I repaired the damage myself. I have purchsed many cases of wine and multi-thousand dollar coolers from Wine Enthusiast but this experience has been most unpleasant and I will stop doing business with them in the future. Sorry you have lost a very good customer. 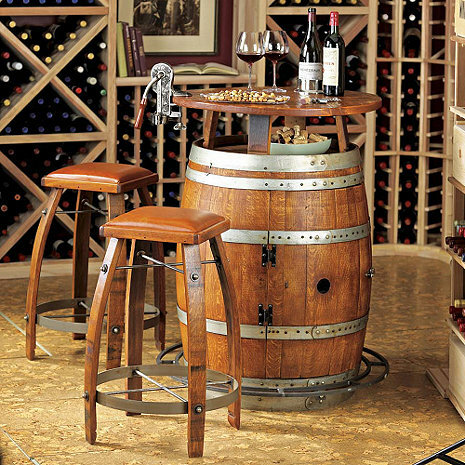 This table and bar stools are a great addition to finish off our wine cellar. They perfectly compliment the custom wine barrel storage system we use to hold individual bottles. Looked at other sets but this set was exactly the color, look and fit we needed to complete our wine cellar. All the sets we liked were a little pricey but it is worth it. Love the look. It is a perfect piece for conversation. We ordered this set based on the pictures alone so we weren't sure if it would look as good as it did in the catalog. It looks better. It looks great in our bar area. We could not be more pleased. A good fit for our wine room and very functional too. Interesting and appealing item. Friends liked it immediately. This Bar works at a wine tasting with friends or near the family pool table. Great place to wait for your shot to come up while enjoying some wine or a cold beer. Enjoy my bar to the max. A great conversation piece and fits well in my wine bar area. Picked the stool leather color to match my leather chairs. It took me a while to decide between the bistro or the double barrel bar. Also to convince my husband. After long discussion we decided to order it. It’s absolutely awesome fits perfectly in our 2nd residence which is up in a mountain. Major problem with their partners as far as shipping goes. This piece is 150lbs plus..you need white glove delivery including 2 people. First attempt with delivery they never showed. They tried coming a second time with one driver..there is a lot of miscommunication with progistics and the courier they chose to use for my delivery..finally received it last night after a May 3..drivers showed up in a KIA a personal vehicle and clueless but none the less pleasant. Wine enthusiast has to realize who you partner with is a reflection of them. I will honestly think twice to ever order big merchandise from them in the future due to all the hassle and inconvenience I was put through with all the calls back and forth and driving to other property and them not showing...but at the end of the day this a gorgeous piece & Josh customer service consultant was professional and very helpful with this process. My suggestion is if your considering this do your research on who is directly delivering your product. I gave it 5 stars even through it all because the barrel is amazing. I bought the brown set! Great quality and very sturdy. Will last for years and offer a unique peaceful place for a shared bottle of wine. I am very pleased my wine barrel bistro! I use it for eating meals, having drinks and to sit and relax while watching a sporting event on tv.